Most scientist today believe that the human mind was never designed; it has evolved, slowly, over millions of generations. The main idea suggested by George Dyson in this book is simple: In the digital universe, too, a conscious mind will evolve naturally, rather than as the result of some design. Artificial Intelligence researches might as well spend their time searching for signs of intelligence on the net rather than try to develop it. 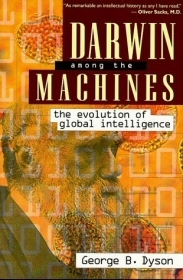 The book begins with a refreshing overview of the history of computing, as well as a brief history of the science of evolution -- with a glance towards the evolution of machines. The history of computing presented in the book is naturally biased towards issues that are relevant to the topic at hand, which is in fact an advantage, since it makes the history seem so much more refreshing. It is a misconception, based on the stereotype of a Turing machine as executing a prearranged program one step at a time, to assume that Turing believed that any single, explicitly programmed serial process would ever capture human intelligence in mechanical form. Turing knew how many interconnected neurons it took to make a brain, and he knew how many brains it took to form a society that could kindle the spark of language and intelligence into flame. The IAS memory was based on the Williams tube -- an ordinary cathode-ray tube (CRT) modified to allow data to be read, written, and continuously refreshed as a pattern of charged spots on the phosphor coating inside the tube. [...] You could watch the bits of information dancing on the screen as a computation proceeded, and Turing, who soon joined the Manchester group, was noted for his ability to read numbers directly off the screen, just as he had been able to read binary code directly from teletypewriter tapes as intercepted messages were being sorted out. Dyson quotes from sources, some surprisingly old, about the implications of the theory of evolution on the world of machines. Newer sources, of course, speak mainly about computers in this context; some of the older quotes in the book, however, date long before the computer was even conceived. In fact, even the book’s title is a quote -- it was originally the title of an article published in 1863 by Samuel Butler. Such a substantial amount of text in the book is presented as direct quotes, that at times it creates the illusion that the book is nothing but a very-well done library research job. But do not be fooled: Dyson certainly presents bold new ideas. Dyson’s main claim is that the evolution of a conscious mind from today’s technology is inevitable. It is not clear whether this will be a single mind or multiple minds, how smart that mind would be, and even if we will be able to communicate with it. He also clearly suggests that there are forms of intelligence on Earth that we are currently unable to understand. What mind, if any, will become apprehensive of the great coiling of ideas now under way is not a meaningless question, but it is still too early in the game to expect an answer that is meaningful to us. While Douglas Hofstadter, in Gödel, Escher, Bach (reviewed here), had jokingly suggested an ant colony as a model of a mind, Dyson boldly states that insects have “socially distributed intelligence” (p. 174). He also suggests that human societies might actually form higher-level minds, in which humans take the part of neurons. And just as a neuron cannot possibly comprehend its role in the brain, so we can hardly expect a human the grasp his role in the greater mind that he is part of. [It] is presumptuous to assume that artificial intelligence will operate on a level, or a time scale, that we are able to comprehend. As we merge toward collective intelligence, our own language and intelligence may be related to a subsidiary role or left behind. When the brass head speaks, there is no guarantee that it will speak in a language that we can understand. With all the ideas Dyson relates regarding the inevitable appearance of intelligence over modern information networks, one might wonder if this hasn't already occurred. In his book Speaker for the Dead (reviewed here), science-fiction author Orson Scott Card suggested that when such an intelligence will emerge, it will be scared to let us know of its existence, knowing that some people, fearing anything nonhuman, will do their best to terminate it. Evolution among machines doesn't have to mean “intelligence”. See Steven Levy’s Artificial Life (reviewed here) for more on that. I have a question: where did our intellect come from? One who assumes the evolutionary views would be unable to answer this question clearly. But, how did our consciences evolve? And, most importantly, what separates man from animals? Nothing? Why, then, do we shudder at the thought of a person being eaten by a shark, when we go about eating animals all the time? The question that the evolutionists can never answer is: How did LIFE come about? Even if humans are highly evolved apes, that does not answer the age-old question that has baffled pagans for millennia. How then, can a reasonable person begin to propose that computers will begin evolving consciousness if that same person can not even remotely account for their own? Just think, why haven't computers (or anything else) evolved by themselves before now? I understand that they have changed, one could say evolved, since the first of them was invented, but it has come about through humans. And if humans are necessary to the ''evolution'' of any tangible thing, then it begs the question, what conscious being(s) caused the human race to evolve or exist? That is what I would like to know. Of course people can account for their own intelligence and consciousness; indeed, computer science research has given us many insights into this matter. The first step for doing so, however, is letting go of religious nonsense.